Provide comfort for the family of Robert Musgrove with a meaningful gesture of sympathy. 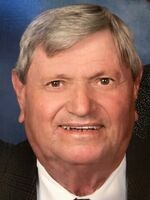 Robert C. Musgrove of Lunenburg, MA passed away suddenly April 2, 2019. He was the husband of Judith E. (Matson) Musgrove with whom would have celebrated 60 years of marriage on April 25, 2019. He was born in Winchendon, Massachusetts on May 20, 1937, the youngest child of the late George H. and Edith (Jollymore) Musgrove. The family moved to Fitchburg, MA when Robert was a young boy. He attended Fitchburg High School graduating in 1956. While in high school, he lettered in baseball and basketball and in his junior and senior year he was named to the North Worcester County All Star Basketball team. He furthered his education at Fitchburg State College majoring in Industrial Arts. He played on the Fitchburg State basketball team and was named to the Small College All Star Basketball Team. He graduated in 1960 with a B.S. in Education and in 1969 he received his Master’s degree from Fitchburg State. He began his teaching career at Masuk High School, Monroe, CT. In 1961 he returned to the Fitchburg area and began teaching at Ashby Jr./Sr. High School. In 1964 he began teaching in Lexington, MA at Muzzey Jr. High and several years later he began teaching at Lexington High School where he remained until his retirement in 1993. He was a long-time member of Central Congregational Church in Chelmsford, MA where he served as a deacon, on the House Committee and as a member of the church choir. One of his fondest memories of being a member of the church choir were the two trips the choir made to Europe to sing in various cathedrals in Germany, Austria and England. He was an avid golfer and was a long-time member of Nabnasset Country Club in Westford, MA. In addition to his wife, he is survived by his son Robert G. Musgrove and his partner Ms. C. J. Gueldner of Dayton, NV, his son David A. Musgrove and his partner, Patricia Ash of Lunenburg, MA, and his grandson Zachary D. Musgrove of Acton, MA. He is also survived by his sister-in-law Rita Musgrove of Plymouth, MA and his brother-in-law John J. L. Matson and his wife Ann, and several nieces and nephews. He was predeceased by his daughter Ann E. Musgrove on June 13, 2001, his daughter-in-law Gilda J. (Kuipers) Musgrove on June 16, 2001, his brothers Donald Musgrove and his wife Dorothy, Kenneth Musgrove, Ernest Musgrove, his sister Mabel (Susan) Day, and sister-in-law Connie Musgrove. A Memorial Service will be held on Sunday, April 14, 2019 at 3 pm at Central Congregational Church, 1 Worthen Street, Chelmsford, MA. In lieu of flowers donations may be made to the church in his memory. To plant a memorial tree in honor of Robert C. Musgrove, please visit our Heartfelt Sympathies Store.